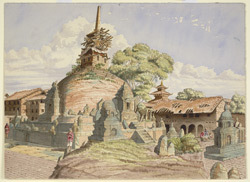 Watercolour of the Kathisambhu Temple in the city of Kathmandu in Nepal, by Henry Ambrose Oldfield (1822-1871), c. 1854. This image is inscribed on the reverse: 'Buddhist temple, called Kathisambhu in the city of Kathmandoo - sketched from the N.W. corner of its Courtyard. November 1854'. Dr Oldfield, who was Residency Surgeon at Kathmandu from 1850-1863, wrote in 'Sketches from Nipal, Historical and Descriptive...' (1880), "This temple was commenced and dedicated to Adi Buddha by Rajah Nurinda Mall, son of Unmar Mall, about A.D. 1450; but it was never completed...The hemisphere of the temple is built of brick, and stands on the upper of three square terraces, raised one upon the other, which form its basement. Round the base of the hemispheres are four large shrines, each of which contains an image of a Divine Buddha; and between these are four small shrines, each containing a carved and perforated stone symbolic of one of the Taras. Numerous stone slabs, on which are reliefs of chaityas, Buddhisatwas, Lamas, Siddhas, and other sacred characters, are ranged around the base of the garbh on the uppermost of the three terraces...The buildings about this court are chiefly inhabited by a race of dancers, who are interlopers, but who have gradually established a colony of their own in the vicinity of Kathisambhu."